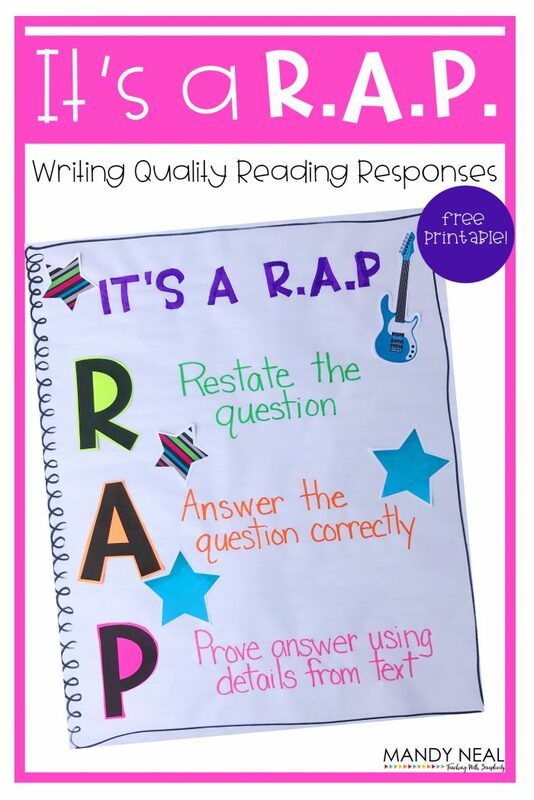 Writing quality constructed responses can be difficult for students to do. 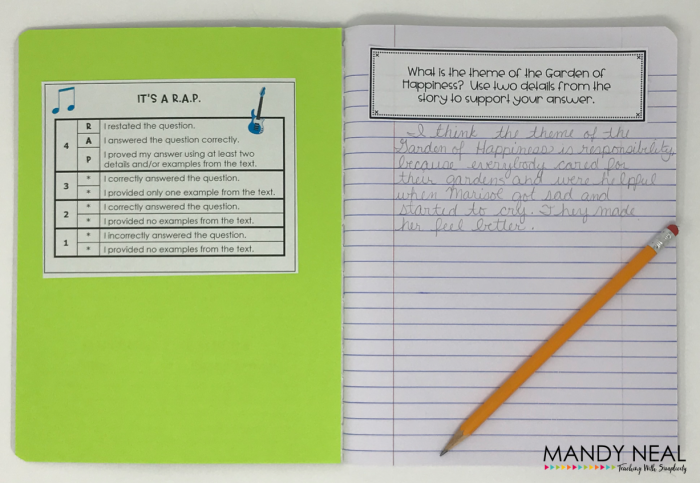 Now days, and even more so in the future, students are and will be required to support their thinking through their writing. As we all know, this is not an easy task to learn let alone teach. I wanted to share a scoring guide that I use with my students. We call it, It’s a R.A.P. It is very straight forward for me as a teacher and easy for the students to remember and apply. My students use what we called a Brain Book on a daily basis. To find out more about our Brain Book, you may want to read THIS post. You will see that the students glued the scoring guide on the inside cover of their composition book. This was their go to resource. When my students were given a prompt, they knew exactly where to go to reference the scoring guide. It’s hard to read the student’s response from the picture, so I have included it below. She received a 4 because she answered the question correctly and supported her answer with two text based reasons why the theme of the story was responsibility. This was not her first attempt, yet a result of time spent practicing and reflecting on how to write a quality constructed response. 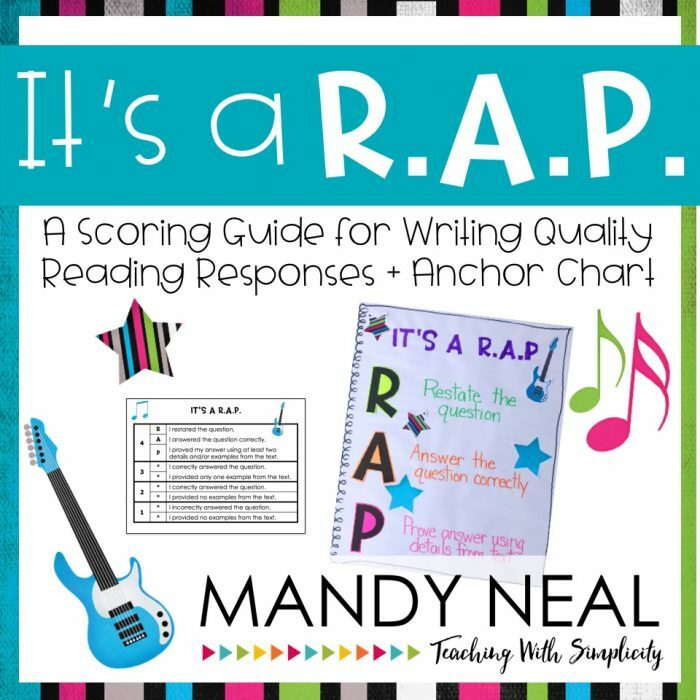 You can download the It’s a R.A.P – A Scoring Guide for Writing Quality Reading Response Answer HERE. Also, there is a free anchor chart template included as well. « An Opportunity Not to be Missed! Follow Mandy Neal's board Seasonal Teaching Resources on Pinterest. MB Neal, LLC is a participant in the Amazon Services LLC Associates Program, an affiliate advertising program designed to provide means for sites to earn advertising fees by advertising and linking to Amazon.com. Amazon, the Amazon logo, AmazonSupply, and the AmazonSupply logo are trademarks of Amazon.com Inc. or its affiliates. My name is Mandy Neal, and I began my blogging journey as Cooperative Learning 365. I love being a teacher! My mission here at Teaching with Simplicity, is just that. SIMPLICITY. Teaching, while rewarding for educators and students, can be overwhelming. My journey here is to share with you ways to uphold simplicity in your classroom no matter the challenges.